Alastair Seeley on the Gearlink Kawasaki. Alastair Seeley claimed his 17th win in the Supersport race to complete a double in the class at the North West 200 on Saturday. 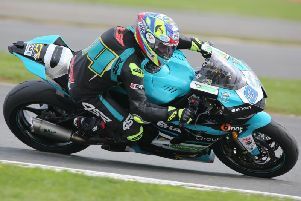 The 36-year-old set the fastest lap of 117.522mph on the Gearlink Kawasaki as he won by more than six seconds from Martin Jessopp on the Riders Motorcycles Triumph with Peter Hickman finishing third (Trooper Beer Kawasaki). Seeley also won Thursday’s Supersport race to extend his tally in the 600cc class to nine wins around the Triangle course. Fermanagh’s Lee Johnston finished sixth after being hit with a 10-second penalty for running on at Juniper chicane when he was in a battle for second with Ian Hutchinson, who later retired from the race on the Came BPT Yamaha with an overheating engine. William Dunlop was also in rostrum contention until a clutch issue saw him drop out on the IC Racing Caffery Yamaha. Malachi Mitchell-Thomas was an excellent fourth on the Cookstown B.E. Racing Honda ahead of Bradford’s Dean Harrison (Silicone Engineering Kawasaki). Meanwhile, Ivan Lintin completed a Supertwins double on the Devitt RC Express Kawasaki. Martin Jessopp finished second with Jeremy McWilliams putting the SGS KMR Kawasaki on the rostrum for Ryan Farquhar’s team, who remains in hospital in Belfast following his serious crash in Thursday’s race. The Supertwins race was halted on lap four, with the result declared after the leaders had completed their third lap.